Live and local right now with Maid to Shine Cleaners. Lauren McDonald, is getting rid of the grim. Lauren, good morning, tell us some more of these hot tips for spring cleaning. Let me tell you one thing, we are off to the races. Because Jordyn she is the Jeff Gordon when it comes to cleaning. This morning we are making sure that we’re getting this place nice and clean, right? So we’re in the kitchen which can be a a place that can collect a lot of grim. 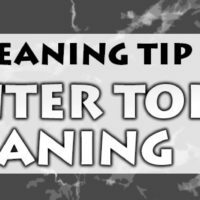 You’re going to want something with a little more scrub to it because of dried on food and build up that can happen in the kitchen. So we’re going to use this miracle worker: The Dobie Pad. The dobie is going to be your new homie. It is! It’s very safe and doesn’t like to scratch items, but it’s tough enough to get off dried on food and things like that. And you can get this anywhere? Yup, like Walmart or your local grocery store. So we’re going to attack this microwave. Hose it down with your spray. Just go to town! And the great thing about this is that we’re using all safe cleaning products. All green. Everything we use is all safe and all natural. Just start scrubbing? You can start scrubbing! Is there a way I need to scrub? Typically we start with the door. Scrub away and then wipe her down. And you guys mix all your own cleaning products, correct? Yes, that is correct. From there again we’re going to start from top to bottom. Start at the top of your microwave, work to the sides and then finally to the bottom. No matter what you’re cleaning you’re cleaning top down? Yes, that’s correct.